Approximately forty percent of food in the United States never reaches the table. Every day, Americans discard 150,000 tons of food, from spoiled leftovers to the supermarket produce that has been sitting in the back of the fridge for a month. This mass of wasted resources is unceremoniously trucked off to landfills and entombed alongside plastic wrappers, old toothbrushes, and a menagerie of other byproducts of human excess—a shrine to the mounting impact our booming population has on the planet as it descends into a culture of disposable convenience. Without oxygen to help discarded food break down, organic materials buried in landfills release methane, a greenhouse gas that can trap 30 times the amount of heat in the atmosphere as carbon dioxide. The EPA reports that landfills accounted for 16% of U.S. methane emissions in 2016, totaling approximately 108 million metric tons of carbon dioxide-equivalent. As landfills run out of space and the atmosphere continues to heat as the result of human activity, it is clear the one-size-fits-all approach to waste disposal is no longer feasible. Wetzel sees urban composting programs, such as the one provided by Common Good, as a crucial component to changing the fate of food scraps. Common Good is located in Washington D.C.’s Ledroit Park—a USDA-certified food desert. The farm is bordered on one side by expensive townhouses and a public housing project on the other. Under Wetzel’s leadership, the farm serves as a place for people from all sectors of the community to come together to grow vegetables, buy produce, and compost. Wetzel oversees Common Good’s two composting programs. The farm has what Wetzel calls its three-bin “lasagna composting” system, where plant clippings from maintaining the farm are stacked in layers and turned every several months as they break down. For processing food waste brought in by members of the neighborhood, Common Good also houses a compost-cooperative, one of several the District’s Department of Parks and Recreation has established over the past few years. “The best thing about the co-op is that members of the community keep the whole thing running,” Wetzel said. Her job is to ensure the co-op is equipped for success by providing the space, materials, and training manuals for the program. In return, the fertile soil produced by the composting system helps nourish Common Good’s crops. Composting creates the ideal environment for naturally occurring microbes to break down organic materials, expediting decomposition while maximizing the nutrients in the resulting soil. Turning compost piles from time to time allows oxygen to become part of the decomposition process, which is crucial to the reduction of methane output. “The aerobic process of composting does not produce methane because methane-producing microbes are not active in the presence of oxygen,” according to Western Australia’s Department of Primary Industries and Regional Development. Wetzel sees composting not only as a way to reduce humanity’s output of greenhouse gases, but also as a way to restore the planet’s natural processes in order to feed future generations of plants, and ultimately, humans. Rebecca Goodstein, a member of Common Good’s Board of Directors, said that small urban farms serve not only as a way to build community, but also provide opportunities for education on the importance of farming and composting. An avid composter, she used to have a worm compost bin under the kitchen sink in her studio apartment. In order to address the country’s food waste and climate crisis, it is important to make people “aware of how to use the food they have,” Goodstein said. She believes that learning to use food properly means not only wasting less, but also properly disposing of any unused pieces, like banana peels and carrot tops. She hopes that composting will one day become a standard part of municipal waste management, as she has seen successfully employed in places like Berkeley, California, where curbside compost pickup is the norm. 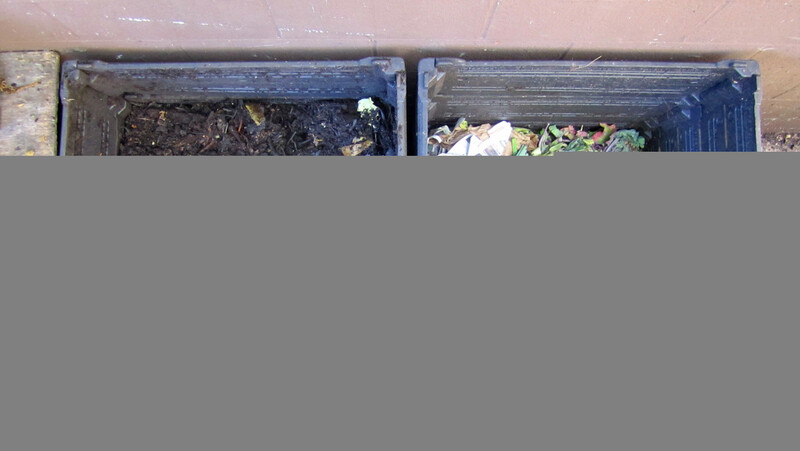 “[In Berkeley] even people who aren’t super environmentally-friendly compost because that is just the standard practice,” said Goodstein. While it may be a while before municipalities fully embrace composting on the necessary scale, local programs continue to fill the gap between what is needed in waste management and what the government has yet to provide. Compost cooperatives, and community gardens that often run such programs, can be found in cities and towns nationwide. The first page of Google results for “compost co-op” includes programs in Philadelphia, Baltimore, Oklahoma City, and Greenfield, MA. Typing “New York City” into the American Community Gardening Association’s “Find a Garden” search engine yields over 250 results. Currently, about thirty people bring their food waste to Common Good to be composted at the co-op, producing about six cubic yards of fertile soil annually.